Feng shui is a bit like bottled water. Thirty years ago, had someone announced regular H2O would be sold to the masses for more than you pay for a decent lunch, anyone within earshot would have fallen to the ground in hysterics. Although the Chinese have been practising the ancient art for more than 4,000 years, it’s hard to believe the hysteria the glorified, not to mention expensive, interior-design option could create. Maybe it’s just the sceptic in me, but that’s the way I see it. Ironically it was the same sceptic which made me the perfect candidate for a master class in feng shui. Fabulous. Conjuring images of dragons, super-powered auras and magic potions (after all, I’m sitting with a Grand Master which screams fantasy world) Raymond reminded me he was just a man from Hong Kong called Raymond. Grand Master is no title to be sniffed at. There are only five in the world, all granted the title by the International Feng Shui Association based in Singapore. Having studied Economics and Business at university in Hong Kong, happy with his degree in his back pocket, Raymond started to explore his more curious side. Four teachers almost crushed his search, each given information which lacked common sense. 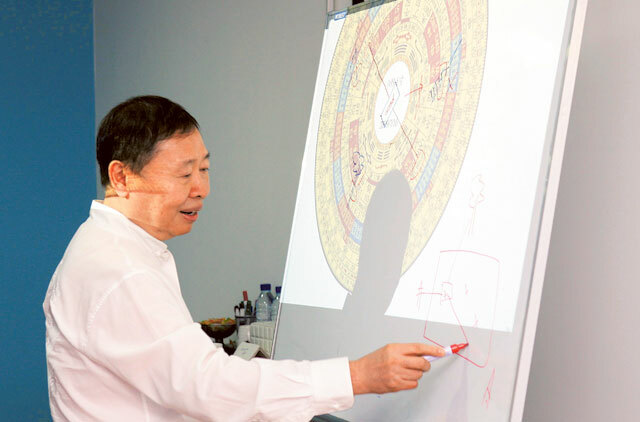 In town to teach a master class in feng shui at Illuminations, a wellbeing centre at Jumeirah Lake Towers, Raymond is keen to pass on the knowledge he has gathered over the years. Q. What is feng shui? A. The literal meaning is wind (feng) and water (shui). It’s an ancient study and analysis of the interaction between people, buildings and their environment. The study reveals how to balance the energies of any given space to assure the health and good fortune of the people inhabiting it. Q. Why are there so many contradictions in feng shui forms? A. Hundreds of years ago feng shui was something only the kings were exposed to. They would release false information about it because they didn’t want to give people the power. Unfortunately, this meant that along with the genuine art, there were also unreliable teachings that were passed down. Q. Can feng shui be taught from a book? A. No, not in my opinion. It can arouse interest and quench curiosity, but if you want to learn how to practise it effectively, you must learn from a Master or a Grand Master. Q. Is it more than just moving furniture around? A. It’s much deeper than that. It’s scientific and uses a compass to determine direction and energy surges. Colour, shape and positioning of furniture can affect everything from sleep patterns to general comfort, which all in turn affect your success in life.